In Small Things Remembered » Columbia University Teachers College initiatives in Afghanistan. Columbia University Teachers College initiatives in Afghanistan. a. 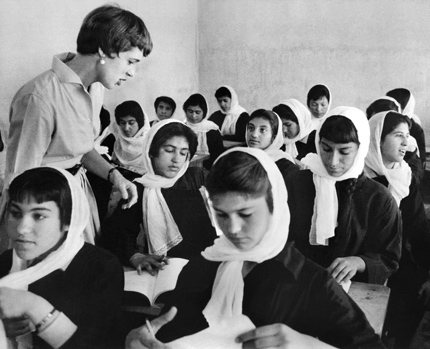 Miss Jane Williams teaches English at the Rabia Balkhi Girls School. b. Clarence Linton (second from left), Mohammed Asghar, President of Kabul University (second from right), and Teachers College instructor Ralph Goodell (far right) peruse textbooks at the USIS Library. In the mid-1950s, Teachers College signed an agreement with the government of Afghanistan to train Afghans in English language instruction and administration through the Institute of Education in Kabul. This partnership began with specialists sent from the United States under the leadership of Professor Emeritus Clarence Linton. 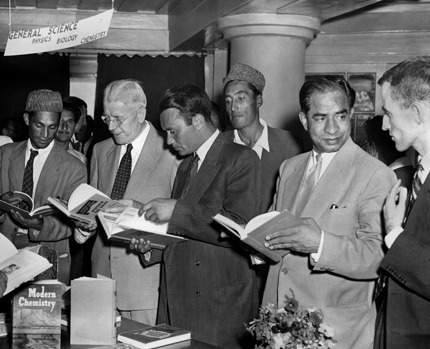 Among its many activities, Columbia published textbooks on academic subjects in Dari and Pashto. Courtesy of the National Archives Still Picture Unit. 306-PS-548-S-61-8487; Black Star.